52 years after his introduction in the pages of Fantastic Four #52, Black Panther is finally making his solo movie debut this week. Sure, we met Chadwick Boseman’s T’Challa in Captain America: Civil War, but now he’s getting a proper introduction in Black Panther, and the King of Wakanda couldn’t have asked for a better creative team to do the job: Director Ryan Coogler and co-writer Joe Robert Cole. We all know Coogler as the celebrated filmmaker behind Fruitvale Station and Creed, but Cole will be a new name to many. The screenwriter has a few credits to his name, and even earned an Emmy nomination for the acclaimed American Crime Story: The People vs. O.J. Simpson episode “The Race Card.” After graduating from Marvel’s in-house writer’s program – which also produced alumni including Guardians of the Galaxy and Captain Marvel scribe Nicole Perlman, and Thor: Ragnarok‘s Eric Pearson and Christopher Yost – Cole was asked by the studio to pen Black Panther alongside Coogler. What resulted is a film that breathes new life into the superhero genre, tackling topics of race and identity in a story that’s as fun as it is empowering. I spoke with Cole over the phone about developing Black Panther. 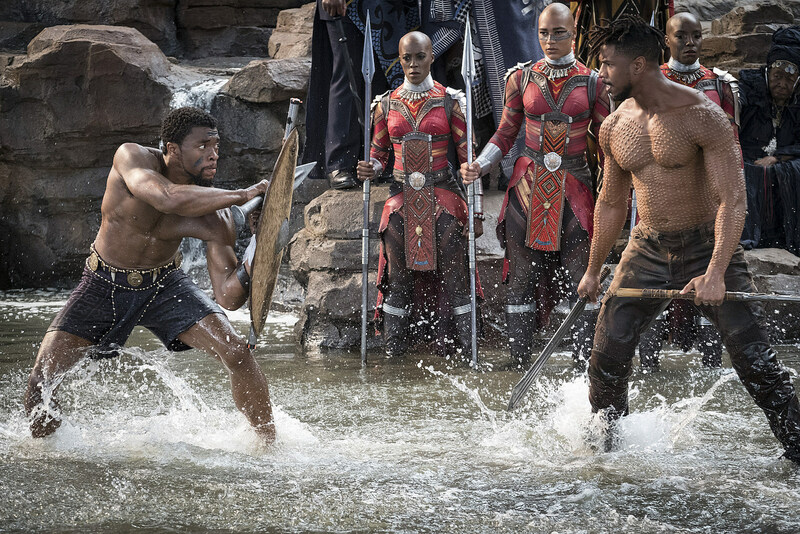 He told me about writing Michael B. Jordan’s Erik Killmonger, the most complex MCU villain to date, and why it took this long – 18 movies, that is – for Marvel to introduce its first lead black superhero. I also asked Cole about his reaction to one Black Panther scene that strongly recalls a scene in Star Wars: The Last Jedi, so beware of minor spoilers. Black Panther has such a long history in the comics. When you sat down to develop this with Ryan Coogler, where did you begin? How much of the comics did you decide to incorporate and how much to make it your own? Well, we read every run. I think we got inspiration from all of them and we had some themes and ideas, contemporary ideas, that we wanted to explore with the movie. We really used the comics as a place to root us, in some sense, and then to kind of explore our themes within the parameters of that. But there was never any kind of mandate about… an example would be like, changing Everett Ross’ character to be a little bit different than he was in Christopher Priest [comics], or that sort of thing. So what we did was, if there were some things within the canon that we felt fit within the parameters of what we wanted to do, then we were able to be inspired and use those things. But the story is one that we tried to tackle on our own. There’s a strong political theme throughout this movie. I’m curious about the decision to bring this story and theme about black identity and politics today into the superhero world. We started writing it I guess a year and a half ago. There’s a dynamic between African Americans and Africans that we wanted to explore and try to figure out how to navigate in a personal way. That was one of the things that our early discussions and throughout, that we were trying to calibrate and figure out within the parameters of the story. So we didn’t know per say, that at this moment in time where there’s a heightened awareness of some of these things [it] would exist, but I think the issues brought us to want to tackle the kind of, “Am I my brother’s keeper?” Some of the thematic issues that were approached or dealt with in the movie in terms of race, those things are not new, those things are centuries old. So the moment that we’re landing, happens to be a very heightened moment, which I think is awesome. The film is so groundbreaking for representation. As a writer, were there things that were essential for you to bring when writing Marvel’s first movie with a lead black superhero, and one featuring an all-black cast? We wanted to ground it in the lens and the voice that we bring to the table. I think there’s a hunger for stories and perspectives and lenses on the world that are different and fresh. And I think there’s a critique with the kind of a predominant perspective in terms of stories. The thing that we wanted to bring was to pour our hearts into it and come from a place of truth and authenticity to what was important and personal for us. And try to craft this story within the parameters of that. I love Erik Killmonger. He’s such a complex villain, and not the one-dimensional, world-destroying threat we’re so used to seeing in Marvel movies. Yeah. I think the best villains are ones that have a strong point of view, a point of view that people can relate to and even agree with. 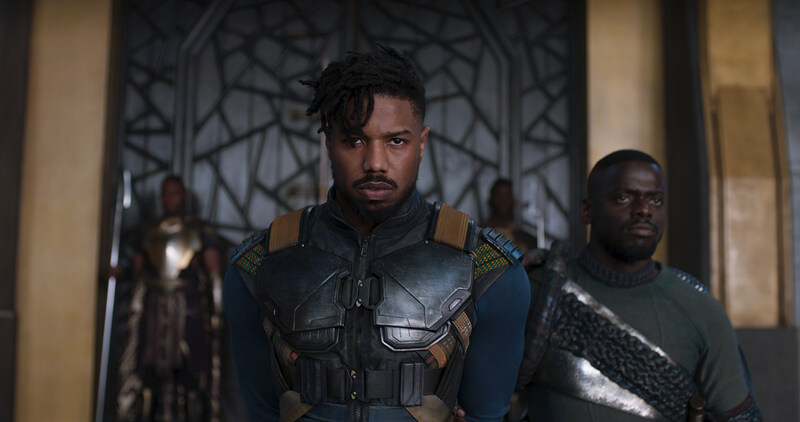 With Killmonger, it’s not necessarily the point of view, but how far you take it that crosses over in the territory of villain. He’s acting from a place of pain. And by the end of the movie, I think T’Challa ends up at the same place that he does, but acting out of empathy. Wakanda is so beautifully realized here. The world is futuristic, but it also feels so grounded in reality. What was your approach to depicting it? That was a big goal of ours. Something that was very important to Ryan – and to all of us, but him leading the charge – was that we root Wakanda in real-world Africa. And once we rooted there, then extrapolate out with the technology and extrapolate out with the mysticism and things that existed within the canon, but more so existed in the cultures of the continent, and try to root our story in that. I really am proud of how that all ended up landing. Without too many spoilers, I want to ask you about the last scene, which is strongly reminiscent of the last scene of The Last Jedi. Have you seen it yet? I have seen The Last Jedi. So wait, the last scene of this? Okay. Yeah, the final scene before the credits when the young kids are checking out the Wakandan ship, and there’s this great sense of hope for these kids as the next generation. The Last Jedi ends with a similar scene; a little boy inspired by these heroes. Did those ideas resonate with you? I’m sure you wrote it before Star Wars came out, but when you saw Last Jedi, was there any connection you made between those scenes? No. I mean, I don’t think that was something where we watched it – I love Star Wars movies, so it’s funny. Star Wars sits in a certain place with me and I never even thought about it. No, I don’t think so. I don’t think that was something. I certainly didn’t have a conversation with anyone about the similarity between those scenes. I know with regards to our film, we really wanted to show T’Challa proactively changing the way Wakanda does business, and actually reaching out and, you know, being my brother’s keeper for the world. We thought that was an effective way to show it. It’s a nice coincidence that both films end on such a hopeful note. It’s incredible to finally have this film in the MCU. In your opinion, why do you think it took this long to have a Marvel movie about a black superhero, and do you think this film will help change that and increase racial diversity across other franchises? I think historically, obviously behind the scenes, in front of the camera, the opportunity particularly on films of this scope, it has been a limited pool of perspectives, in terms of the stories being told and the people telling those stories. I think the opportunity now going forward, or at least my hope going forward, is that the hunger that exists out there in my opinion amongst viewers for new perspectives, new lenses on the world, new storytelling will keep the demand for movies that, like Black Panther, come from a different perspective. They will keep those movies being made, and those TV shows being made. I think in the past, there was a belief that movies didn’t make money that had minority casts. There were other social issues, obvious social issues that prevented films from being made that had predominantly minority casts. So I think going forward the hope is that this isn’t lightning in a bottle where we’re trying to recreate what Panther does, but that opportunity for other voices, the opportunity for other perspectives, remains strong. That’s my hope at least.